My sisters are the absolute best. Truly. They're more than my sisters... we have a special bond and I am extremely lucky to have them both in my life. I love them dearly. They were extremely thoughtful and sweet and thought about every detail of planning a shower for Andie and I. They wanted it to be perfect and worked closely with our family friend, Buffy, to try and make it as creative as possible. My mom was also a big part of making it happen, she loves being a part of all of it. It was one of the sweetest things ever... every little detail - the colors, signs, candy, diaper cakes, ribbon, flowers... they put so much time and thought into it all, and I was extremely overwhelmed by all of it. I felt so special - Andie is a lucky girl to have these two as her aunties. The invitations were adorable, my sister, Kel, ordered them off of Tiny Prints and I was obsessed with them. It was so exciting to open it up in the mail. I looked forward to this shower for months... not because of the presents, but because of the people. All of the ladies who were there have been so supportive of me and shown so much genuine love since hearing about Andie coming into our lives. Some of them drove 2 hours to be there, and it really meant a lot to me. It was amazing to be surrounded by so many amazing people. I am abundantly blessed. It's definitely a day I will never forget, and one I will be sure to tell Andie all about!! At almost 33 weeks preggo, I had the hardest time trying to figure out what to wear... found this dress on sale at Victoria's Secret. My gorgeous sisters... Kelly & Julie! The adorable candy station... if you know me, you know I loveeee candy! 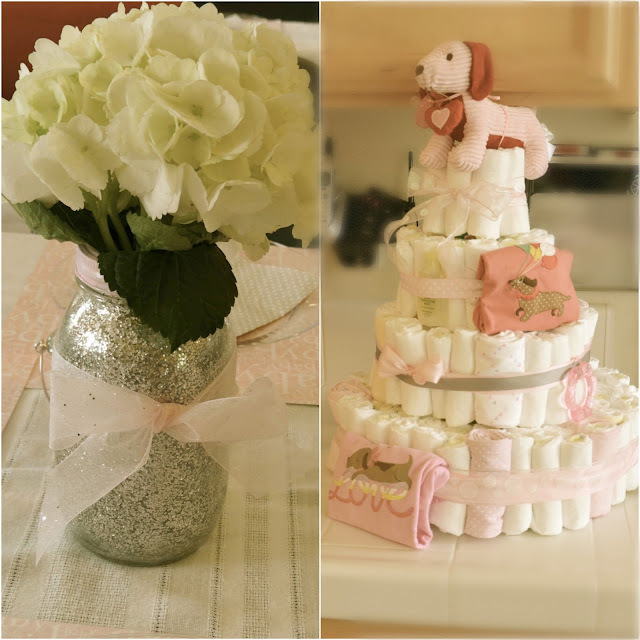 My favorite flower centerpieces - and the weenie dog diaper cake. They honored our first babies, Max & Zeus! Desserts - homemade cupcakes and cake balls - both funfetti and both delicious!!! 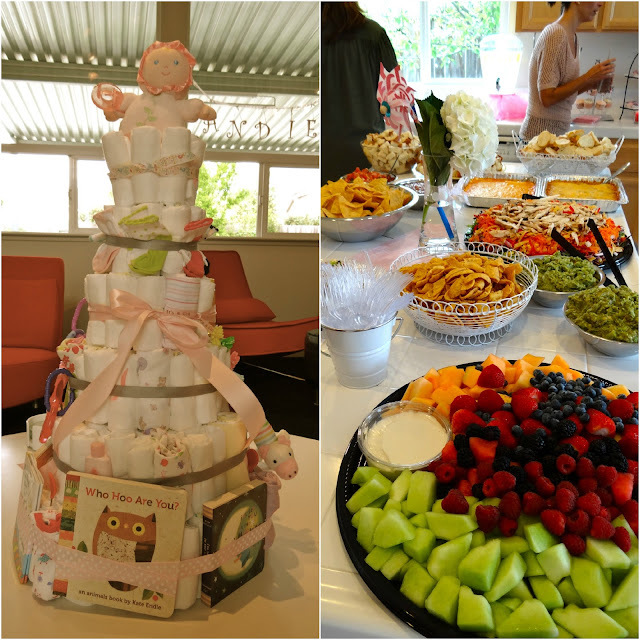 The 6 layer diaper cake... adorable! And all the food - so much good food! TL, my MIL Cindy, and my beautiful mama. The goody bags for the candy station... I love the chevron! The adorable invite from Tiny Prints... it was so sweet! Andie and I were spoiled with so many amazing gifts... it was so much fun opening them all! It was such a wonderful day and it was very heartwarming for me. Definitely a day I will never forget, thanks to my amazing sisters! You look beyond amazing in that dress! Such a perfect color for you. You are glowing beyond belief :) Love the first picture of you and the last one of you and TL! The invitations & the weenie dog "cake" are super-cute. oh my what a lovely shower!! every detail looked perfect and so thoughtful!! and YOU, GORGEOUS girl! Beautiful! Such sweet sisters! You are almost there! Such a beautiful shower! You look amazing!! I couldn't pull that dress of when I'm not pregnant! lol So glad you had a wonderful time. So adorable. You look gorgeous. 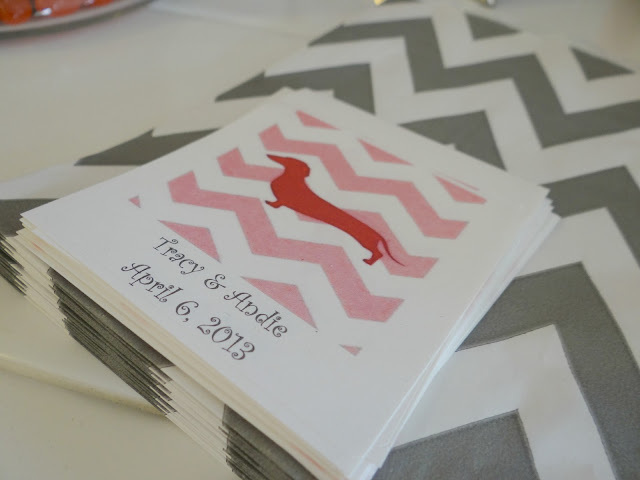 Where did they find those cute doxie cards and napkins??? You look gorgeous in that dress! I can only hope to look that good when I have a baby! Love how they honored your first two babies..so cute! HOT HOT HOT !! Wow, you are smokin' Mama! And you look so happy. What a fun looking shower... hope you got everything you wanted and more! Looks like such a special day. Enjoy these last few weeks! You are one hot mama! Great dress and you look fab!!! Everything at your shower was beautiful. Your sisters did such a great job. Love all the details. You are BEAUTIFUL!! I love your dress and necklace too. 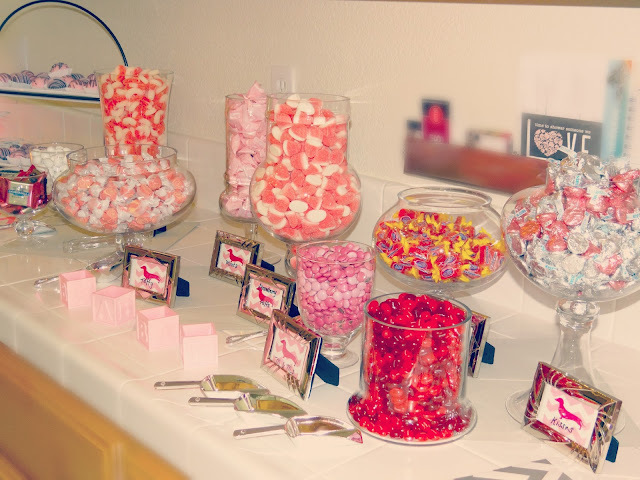 What a gorgeous baby shower!! How stinkin cute was the blanket with her name on it with the polka dots!?! Love it! You look amazing! Oh my word. One hot looking Mama to be! Seriously- amazing!! You are the hottest momma ever!!! Who would have thought that anyone 33 weeks pregnant could pull of a VS dress? Adorable party, by the way!! What was your favorite gift? We got a monogrammed blanket for Cam that I just bawled over...I loved all of our gifts, but that was my favorite because I knew he would have it forever! i am LOVING your outfit, sweet friend...you look incredible and you can see all the joy and happiness in your face! it looks like your sisters went above and beyond and all those perfect details that have your name written all over them...HAPPY DAY INDEED!! Pregnancy looks amazing on you!! Seriously, from the front you don't even look 33 wks!! You look fabulous!! Your sisters are very creative....such cute details. I'm glad you had such a great time at your shower! Wow!!!! What a beautiful shower - I just love the colours and all the decor - your sisters did an amazing job! And wowee girl, you look amazing!! And that dress is so stunning on you! you look absolutely gorgeous! 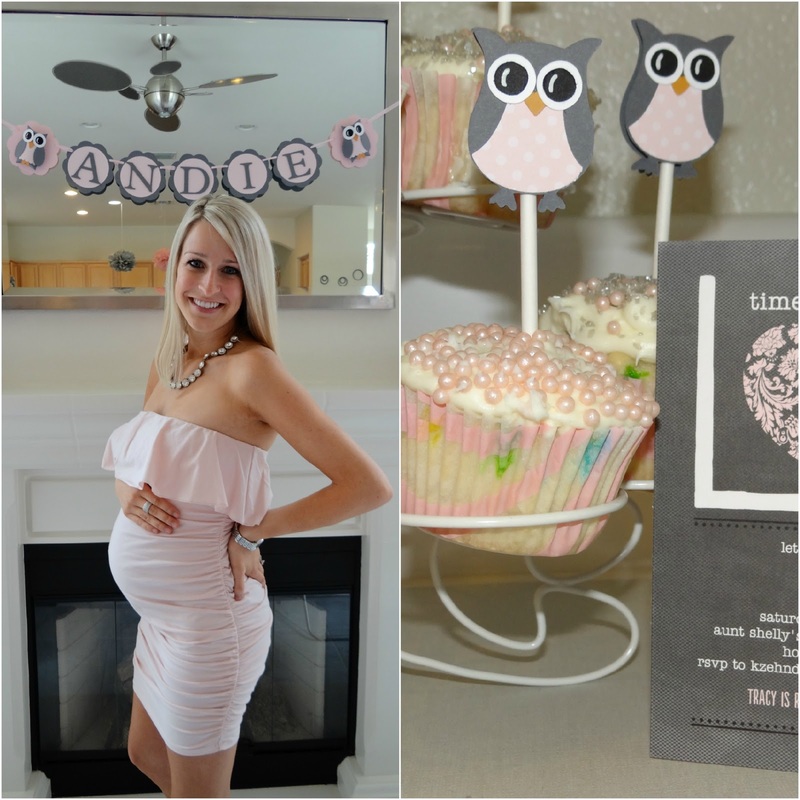 such a perfect shower before you met precious Miss Andie! What a gorgeous shower! Everything looked perfect. You look beautiful - love that dress! You are such a beautiful momma-to-be! You look fantastic in the dress :) I remember my baby shower like it was yesterday. So much fun! such a gorgeous baby shower and you found the perfect dress :) Looks so cute! So cute!! All the decor and gifts are adorable! And you look amazing! I know everyone else has said it as well, and I'm a little late to this post, but oh goodness that shower is crazy adorable!! Every detail is so sweet. And I agree with the other girls, you look phenomenal in that dress...love it!! So happy for you, and it truly looked like the perfect celebration. :) By the way, I'm just loving your daughter's name! OMG! Such an adorable shower!!! :) I LOVE that dress on you! So dang perfect!!!!! Oh my gosh your sister outdid themselves!!! What a beautiful day! And that dress on you - stunning! 1. You look STUNNING! and glowing! 2. What an amazingly thoughtful and perfect shower! 3. The pup and the chevron..fantastic! 4. You and TL... absolutely precious. You guys are great together and are obviously going to be amazing parents. You look amazing Tracy! And your sisters are so sweet for throwing you such a lovely baby shower. So happy for you and TL! Love all the details! You look gorgeous! You looked so so pretty! Love your dress and you looked amazing in it with that tiny bump of yours! 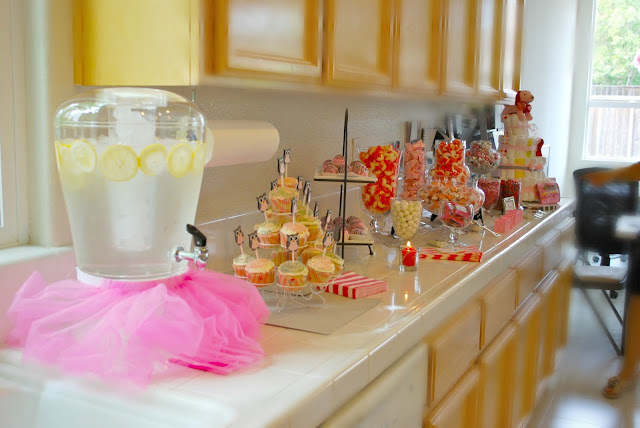 What a cute shower... all the details were adorable! I love how they incorporated your doggies in some of the decor! ha! If you don't mind me asking where did you register? Any items you recommend?